It may not have the flash of Uncharted: Golden Abyss, but Sony's mini game compilation shows potential. Looking through PlayStation Vita's impressive launch lineup, Little Deviants is clearly the oddball. Here we have a new intellectual property that is essentially a collection of mini games. How does Sony expect this to sell alongside the likes of Uncharted: Golden Abyss, Wipeout 2048 and even Hot Shots Golf? The answer remains a mystery, but one thing is clear: Little Deviants is surprisingly enjoyable. At least that's how we felt after playing five unique mini games. Granted, this represents a small slice of what the package has to offer. You're looking at roughly 30 levels, each of which contains 25 to 40 sub missions a piece, but if the demo is any indication, it could be one of the system's biggest surprises. It boils down to this: Little Deviants puts the handheld's best features on display in good fashion. It's sort of like Nintendo's 3DS, which contains the Face Raiders Augmented Reality game, but much higher in terms of quality. Actually, we'll start there. 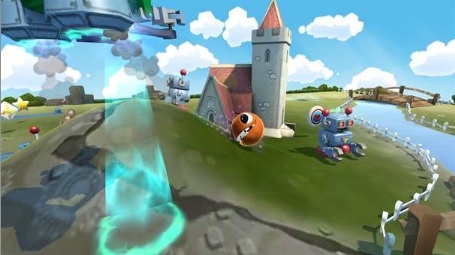 One of these mini games, Botz Invasion, tasks you with using a NERF style cannon on the bottom left corner of the screen to destroy evil robots and prevent them from kidnapping the bizarre looking Deviants. 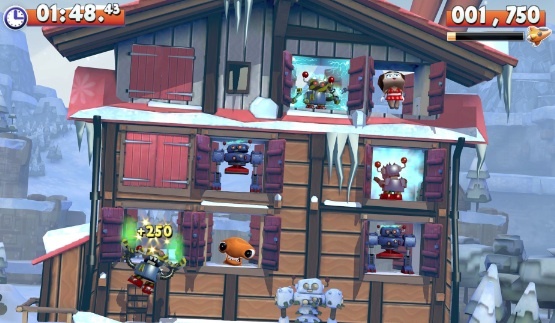 The game works in tandem with Vita's back facing camera, displaying (in high quality) the various characters in the "real world". To play, you stand (it's best to stand) and rotate 360 degrees in search of these robots, following on-screen red arrows to track down bad guys. Then it's just a matter of tapping the right trigger to fire. Not the most complex game, but fun nonetheless. Next up was Shack Shover, which plays somewhat like a light gun shooter, except we used our fingers. Here, there are two houses comprised of shutters. As they open, you basically tap the robots using either the rear touch pad or touch screen, making sure you don't "accidentally" kill humans or even humans dressed as evil robots, which is super confusing. The game works on a timer, so the more mistakes you make, the more seconds get slashed until it hits zero. Then you post the score to an online leaderboard. Good stuff. From there, we moved onto Rotten Rumble. As zombies jump into a wrestling ring, we pulled back on our Deviant, Angry Birds style, and let it rip, watching as the little critter steamrolled through masses of undead, resulting in hundreds and then thousands of points. Simple, addictive...we were hooked. After dominating the squared circle, we commanded a spaceship for eight rounds of Depth Charge, a SIXAXIS powered game that shows off Vita's tilt capabilities. 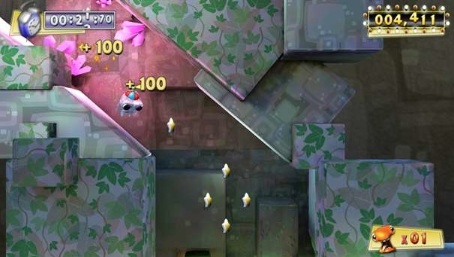 To succeed, you must quickly maneuver the ship through a variety of increasingly difficult stages while picking up stars en route to a bomb before the clock expires. This immediately brought to mind the types of games we've experienced on the iPhone and iPad, but the tilt controls were superior to most apps, and only required subtle movements. Finally, we attempted to tackle Rolling Paradise, without question the toughest game of the four. You've probably seen the video, where players use the rear touch pad to create hills and roll a Deviant around the play area. We love the tech, but figuring out how to guide said monster safely past robots while collecting keys and other pick-ups was quite a chore, though Sony admitted this particular game has a steep learning curve. Ultimately, we walked away from Little Deviants wanting to play more. It's definitely on our radar for the Vita's launch. Sony just needs to be careful when it comes to price, which should be at least $10 less than the norm. That said, keep an eye on this one.